The Kwahu Traditional Council (KTC), has launched the first-ever Kwahu Easter Marathon and Community Football Gala, as part of the activities marking the 2018 Easter Festival. 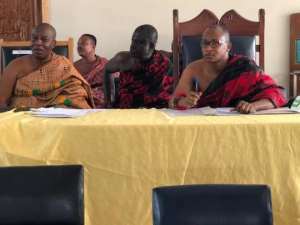 The launch, which was done during the meeting of KTC, at its headquarters was attended by Kwahuhene Daasebre Akuamoah Agyepong II and all the chiefs of Kwahu. Speaking at the launch, Mr Edward K. Boahen, Project Coordinator of the events, said, the main idea of the marathon and community gala was to give the festival, a new face by creating an avenue for competition as well as keeping fit. He said over the years, the festival has been associated with social vices and this has negatively affected the image of the community. Mr Boahen further noted that aside from the fun and exercise, the two events are aimed at giving the youth of Kwahu, the opportunity to exhibit their sporting talents and also change the face of the festival. In an interview with GNA Sports, Nana Effah Opinamang III, Obomenghene and the chairman of the Easter Planning Committee, noted that the healthcare and health issues of the communities are paramount to the chiefs, hence the decision to collaborate with Let's Tour Kwahu and Medivent Consult to organize the two events. According to Nana Opinamang III, this year's Easter would not only be for fun but provide an opportunity for the young and old to exercise and socialise through sports. 'This event is going to change the face of our Easter festivities and it would not only bring us fun but also a form of exercise. 'I am calling on all well-wishers and corporate Ghana to come on board and support Kwahuman to make this event a success. 'We need more sponsors to make this a reality so that we can have attractive prices for all participants,' he added. The marathon is opened to all regardless of age and gender. According to the organizers, Lets Tour and Medivent Consult, with registration forms can be picked at the office of KTC at Mpraeso, Ghana News Agency in Accra. In all 16 teams are expected to participate in the two-day gala, which will be played at the Mpraeso Stadium or St Peters Senior High School.